Where is your priority? What comes first in your life? My family and my home are my priorities. I’ve been working really hard on making a successful blog. This is a positive and negative thing at the same time. My page views and comments have gone up. I’ve been getting more followers by email and social media. I’m loving all the new growth. I was writing five posts per week, but I was getting burned out. That’s why I took a week off from blogging in March. That break felt amazing. It was so nice to sit back and relax and I didn’t have to worry about writing. I was putting so much pressure on myself to writing five posts and getting my posts on social media. That’s why I started writing only three posts per week. I couldn’t keep on having five days of posts. Writing only three posts per week definitely helped with my workload. But the trouble was my blog was becoming a priority over my family and my home. I was periodically on my computer and phone throughout the day working on blog work. Instead of working on my blog during certain parts of the day, I should have focused more of my time with my family and home. On the back of my mind were multiple things I wanted to do with my husband and girls and several things I wanted to do for myself. My house was falling behind on cleaning, reorganizing, and clutter piling up. I had clothes to take care of for the new season, clothes that no longer fit, and donations to gather again. I had so much to do and didn’t have as much time to do them as I wanted to. Something had to give. That something has to be blogging. I’ll be still around in the blogging world writing posts, but I’m going to focus more of my time on my family and home. My priority will be focused on them, which is where it should be. 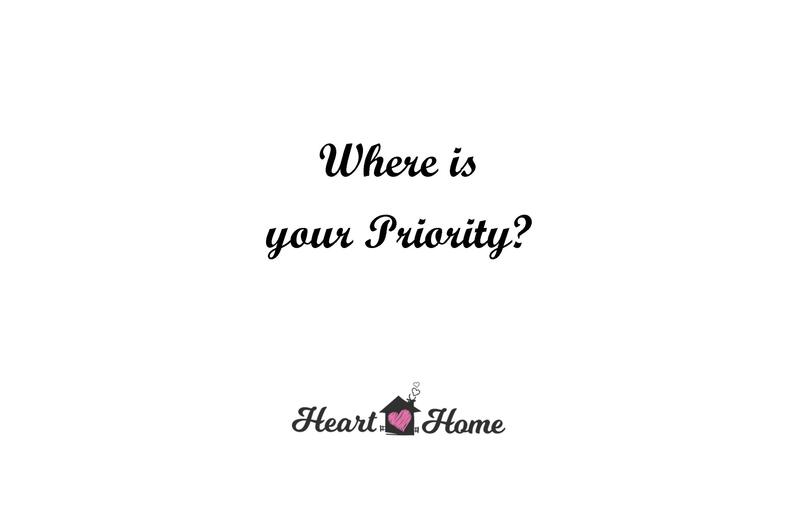 Where is your priority? What are you focusing more on in life? Next Post Blue and White Table Setting Picks from Target + 30th Birthday! My priority has always been the ones I love. Oh goodness…I’m all about taking social media and blogging breaks. I know for me, I put a lot of pressure on myself to make sure I blog, keep up with facebook, twitter, instagram, pinterest…it gets exhausting. As bloggers, we are everything: we are the writers, the social media managers, the photographers…it is a rewarding job, but it’s a hard one! Oftentimes, when I’ve taken a break, I usually come back with a clearer head and ready to jump back in. Kudos to you for taking a breather! Great post! My kids are always my first priority. My own health and wellness and my business come next. So important to take a break and take care of yourself. I just wrote about that recently. My priorities are my family and my health. Sometimes we get so caught up with work we forget to make time for them. It’s important to take breaks and take care of yourself first! Balancing home/family life and blog life is definitely a hard task! We know in our minds that family should always come first, but sometimes it’s hard! Everyone needs a break sometimes! You have to take care of what is important to you! I’ve been there and, if it’s right for you, when you make the decision that blogging isn’t the top priority it’s a game changer. Blogging breaks are refreshing. Hopefully you can find the right balance between them all! For me it’s my blog and my relationship/family which are equal priorities as my blog is my work. Yes girl, family first!!!! I used to write so many more posts, but find the balance makes for SUCH a happier lifestyle and home. I’m about once a week now! I really could use a week off from blogging. Sometimes I get really overwhelmed with it. May is such a busy time with my kids finishing up school and I’ve def. stopped doing 5 posts and I’ve been doing 3 a week now. It helps, but sometimes I feel like even 3 posts is a lot to get out every week! I love blogging, but due to all my other responsibilities with home, family, teaching piano, church, etc. I’m happy to post once a week! We will never regret putting our children first! I feel you! If I had an office to work from 8-5, then it would be different. Sometimes it feels like I’m putting in more effort than the results of you know what I mean. I have few blog ideas that I’m working on. I’m enjoying catching up on your blog as well.